Arnold. So much to say. You could talk for three hours about his life and accomplishments. I’ll do my best with three minutes. Like many people, when I first met Arnold more than 20 years ago, I wasn’t immediately sure what to make of him. He definitely wasn’t what you’d call warm and fuzzy! His intelligence and quick grasp of issues was obvious, but he seemed a bit aloof. And he wasn’t exactly known for his patience and gentleness when he chaired a meeting – as many a speaker learned if they took too long getting to the point! However, as you got to know Arnold — to spend time with him — you began to see the real man. You realized that, while he wasn’t all smiles and hugs, it was because he loathed shallowness – he preferred a deeper, more meaningful connection. You came to appreciate his good humour, his story-telling, his passion. And of course, you came to see a tender side that endeared him to you. You will hear today about Arnold’s love for his family, his impressive journalistic accomplishments, and his great efforts to promote freedom of expression. I‘d like to tell you just a bit about another passion to which he devoted much of his life: the labour movement and the fight for social and economic justice. Arnold was the first president of CWA Canada, the country’s only all-media union, which represents 6,000 workers at the CBC, Canadian Press and newspapers and other media companies coast to coast. It is a position I am now honoured to hold and to carry on Arnold’s legacy. I was Arnold’s deputy for most of his 16 years at the helm of the union and we had many long talks about what we wanted to accomplish for journalists and for the labour movement. What I learned most from Arnold was the importance of looking at the big picture. For him, being a media union leader was not just about getting pay raises for members or negotiating contracts. 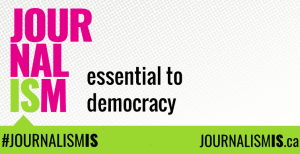 It was about being part of a greater movement for social and economic justice, freedom of the press, and responsible, caring and transparent democracy. As Arnold saw it, protecting quality jobs and quality journalism and ensuring social and economic equality was vital for a healthy society — and a healthy democracy. He knew that working in isolation and defending only your own interests was a recipe for disaster. He saw his journalistic career inextricably linked with social justice, defending freedom of expression, and standing up for quality jobs. Whether he was in the newsroom, chairing a CWA Canada meeting, leading a CJFE campaign, bargaining a CBC collective agreement, or marching in a labour protest in the streets of Seoul, Arnold always did what was right. Arnold was so much of what we need in a leader: whip-smart, principled, incorruptible, sincere, caring, passionate. If we had more leaders like Arnold in positions of power, the world would be a wonderful place indeed. Arnold: you fought the good fight to the end and we will keep up that fight. Phyllis, Gillian, Jeannine, David: on behalf of CWA Canada, Arnold’s union family, and his sisters and brothers coast to coast, our deepest condolences. 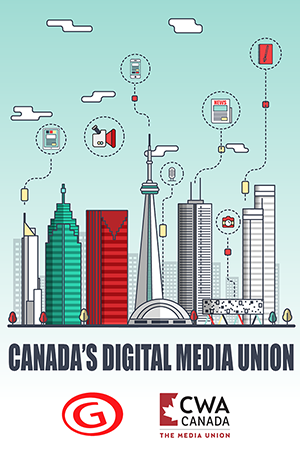 We are Canada's oldest media union with roots going back to the 1800s. We represent workers in the communications industry, from news services to print, digital, radio, television and mailing operations. Our employers include the CBC, The Canadian Press, VICE Media and major newspapers from coast to coast. Site development by Foil Media | Branding & Design by Sumack Loft | © 2017	Powered by WordPress.com.